SEA? What is SEA? What does SEA stand for? These were the questions that I used to ask myself, and, perhaps, there were many others at SEA who were wondering too. But, at least, we all knew the work of SEA. With all those questions in my mind, I grew up watching the good deeds of SEA. And today, when I see myself in this league, I can’t believe that I, along with my childhood friends and siblings have come so far that we are almost on the verge of “extinction” from SEA. We are indeed about to shape our own future and stand on our own feet. Whatever our aim, wherever we go, one thing is for sure: we’ll always carry the name of SEA and of all the sponsors in our heart. But the history of SEA is not yet finished! Like we have made the history of SEA, there are many other kids just like we used to be 2 decades ago, who are here to make another history at SEA. This year, 12 new students have joined the SEA Home at Sadobato, and I would like to report on each of our newcomers and to give an update on all our other junior students living in the SEA Home. He is the youngest of all: 6 years old! He joined the SEA Home in February 2014, and he is now in nursery. He is a very cute boy who makes everyone loves him. At this very tender age, he already knows what caring and sharing means. He is super funny and makes everyone laugh with his silly activities. What he likes the most at home is to be with the seniors: he likes to listen to the seniors, to talk like them and mimic them. Sandesh is a very clever boy. When he makes mistakes at home he knows that he is going to get scolded, so he very cleverly throws his charming smile at us making us forget what he just did or what we are there for. He smiles all the time (except when he gets angry, which generally happens fast!). He is very mischievous and not that studious. Given his age, he likes learning with fun. He gets good reviews at school, although his teacher complains that he likes to sleep a lot. He always finishes his work very soon and then he orders his teacher to switch on the fan for him, so that he can start sleeping just below the fan! Isn’t it funny? Can you tell me who at this age (or even at an older age….) can give orders to its teacher……? This is Sandesh! She is at least 11 years old, but with her disability she looks much younger. She is a very sweet girl who smiles all the time. She is also very sensitive. She shows great dedication towards her studies and gets good remarks from her teachers. She had no educational background prior to joining SEA early this year, so Sushila is now in class 1. She secured a percentage of 72%, standing 14th in her class, at her first terminal examination, which gives you a good idea of the extent of dedication that she has to her studies. She is a very caring person. She likes to dance and sing and she is interested in all sorts of art as well. As soon as she finishes her homework, she sits down to draw. She is another class1’s student, so we could say that she is a class mate of Sushila and, of course, a friend or a sister at home. She is very talkative and very helpful as well. Charimaya is close to anyone in the home. She is a bit lazy in her studies, but she nevertheless managed to get a percentage of 80% at her first term exam. She likes to play and run here and there and go up and down. Like Sushila, she is very interested in art. Aruna has such a small voice that we don’t hear her speak even if she is two steps away from us. She is the most smiling person at SEA. Actually I have never seen anyone smiling as much as our Aruna does. She is very curious to know about things. She tries to study and to do well. She shows some talent in singing and dancing. Aruna cares for others, and she likes sharing. But she is still much less interactive than others. Her teacher complains that she does not speak in the class. She studies in class 2 and got a percentage of 60 at her first term exams. Aruna is a very sweet and adorable girl. If anyone in the house had to describe Ankit, everybody would come up with many adjectives. He is very stubborn. He fears no one except his elder cousin brother Anga. He is very careless, and his teachers complain that despite having such intelligence he is not utilizing it. But it’s not that Ankit only has a bad side, as he has many beautiful qualities. He is very creative, and he likes to make his own things, with his own ideas. He is extremely caring and he likes sharing, especially with Prabin and Sandesh. Ankit loves them a lot. If he could be described by one word, it would be “intelligence”. He has such a bright brain! He can really capture things very fast and does not forget them easily. When we (the seniors) organized a quiz competition and a spelling competition, his intelligence shone out, as he knew more things than others including the elder students. He is very interactive and is much interested in dancing and singing. Ankit jumped class 2 and is now studying in 3rd grade. He is finding it difficult but he could nevertheless secure a percentage of 66 at his first term examinations. After Satikcha, here is another little mouse in the SEA Home! She is extremely talkative, and she talks with a surprisingly loud voice. Whenever a senior enters her room, she is the first one to greet us with her loud and husky voice. Rammaya is a moody person, but she is a very sweet girl close to anyone. She shows interest in her studies. She has improved a lot since she joined the SEA Home when she started from “nihilism”. She is an extremely fun-loving girl. She is curious by nature and she is interesting in art. She likes complaining about others, but when one complains about her then she makes such a long face….. This is really funny to observe! She has very good reviews from her teachers. She is currently in class 3 and she secured 70% at her first term examinations. He is a very sensitive boy. A key feature of Prabin is that he likes to sleep a lot! Well, he likes to sleep even while reading or eating! He is also very fond of playing football: when he is the defender, he is super active, but when he has to be a goalkeeper then again he looks so sleepy…. He is a mischievous boy, but he is good in studies. In the Home’s tuitions, he is not studious, so that he is getting a scolding most of the time, but when his school results are out, he always surprises us with his excellent grades. He got 73% at his first term exams and he is in class 4. She is a very clever and mischievous girl. She is also very funny. She has been improving in her studies because she now has a good environment to study. But she could get only 40% at her first term exam. She is in grade 4. She is very interactive and also comes forward to speak for others. Laxmi is a very caring person, and she likes sharing as well. She is the most helpful girl in the house. She helps in the kitchen and also cleans her room. No one has to tell her to do this or that. She is an introvert who does not have many friends. Her behavior depends upon her moods. She is very sensitive and gets angry very fast. She likes to dance and participate in dances in her school programs. She is a good student. She now studies in class 5 and she got a percentage of 68 at her first term exams. It seems that she embodies all the qualities. She is very, very helpful in the Home. She cares for everybody. She is very close to Sushila and she takes care of her really well, better than anybody else in the Home. She is close to everyone and always shares a beautiful smile with all. She likes to interact a lot and has many friends. She is a bright student too. She got 78% at her first term exams in grade 5. She likes to dance and sing and play as well. She is a very sweet and an adorable girl. He is a very sweet boy who has a really cute smile. He is very helpful in the Home. He helps Sandesh a lot in his homework. He is himself a good student. He is frank and sensitive. He is extremely interested in watching and playing football and is a diehard fan of Christiano Ronaldo and Lionel Messi. Apart from that, he likes to watch movies. Sudip is very caring, and he likes sharing as well. Yet he is a bit lazy in the housework and he does not always complete his works on time (for e.g. washing clothes). In his studies, he does all his work including the creative work by himself. He has good reviews from his teachers. He is now in 6th grade, and he got 66% at his first term exams. He is a lovable person. She is a fun-loving girl. She is really funny and she interacts well with everyone. She is much interested in singing and dancing. Over the past year, Sneha has been improving in her studies, and she has no more complaints from school. But she is lazy. She is also little childish given her age now. Sometimes, we feel that Sneha is comparable to our little Ankit in terms of intelligence, but at other times, you don’t get the impression that she is intelligent or, at least, that she knows much of anything. Yet she surprised everybody when she answered most of the questions in the quiz competition. Also, when, at school, students of her class were asked to write a self-made poem, her poem was selected as the best one, with good English. Wow! What an achievement! At her first term examinations in 6th grade, she scored 62%. She is very sensitive. I have this feeling that if she had to fight for herself or for others she would not step back, which is a good thing. She is very hard-working and gets good remarks from her teachers. She is now in 6th grade and she got 63% at her first term exams. She is curious by nature. She wants to have knowledge about many things. She is introvert, though. She does seem to be very close with anyone except people of her age and seniors. She is very sincere. She is a very nice girl, full of shyness. She likes to watch lots of movies and she cries easily over a tragedy scene. She is very sensitive. She is also caring. She has a huge interest in singing, and without any doubt she has a very melodious voice. She dances really well, too. She is also an excellent student, very hard-working. She had brilliant results at Heartland Children Academy (HCA) where she used to study. But she had to change school last April, as she was shifted to the SEA Home (which is far away from HCA), and the change of school was a bit disrupting for her, as she loved her previous school. She now studies at MAV in 6th grade. She got 65% at her first term examinations. Usha is a reserved child. At home, she always tries to do her homework on her own, but she helps little kids with their homework. She has to open up and overcome her fears of new situations. She is a very sincere and honest child. She is mischievous and very sensitive. She is also very fun-loving. At home she is close to everybody. She is a bit talkative and very funny. With her silly activities she makes us laugh. She is also helpful in the home. She does all her houseworks, although sometimes she tends to be lazy. She loves to play, more than sing or dance. She now studies in class 6 and she got a percentage of 63% at her first term exams. She used to stay with her parents in Kathmandu, but their financial situation, which was already shaky, deteriorated further last year when her father lost his job. So, SEA decided to transfer her to the SEA Home, as she could no more study properly in her home. She is a good student and a very sweet girl. He is very introvert, which may be due to the fact that he didn’t get parental love in his early childhood. He lost his parents when he was a very young child. He was brought up by a relative but they lived in destitute conditions. He has been sponsored by SEA since May 2012. He was initially sponsored as a boarder at Shree Liti School, but was transferred to the SEA Home last April, as he didn’t have any family support. Since then, he has been improving in his attitude becoming more interactive with others. He is not that interested in playing. Yet he is a bit like a child. Both his class teacher and his tuition teacher say that Pradip has to be flattered to do his homework. They have to praise him to boost him, and only then he does his school work properly. His mind is a bit slow. He is currently repeating his 7th grade at MAV, where he got 36% at his first term exams. He needs to work very hard if he wants to catch up at school. Attending a vocational training after grade 8 or 10 could be an attractive option for him, as there are several good professional training options in Nepal, notably at the CTEVT (Council for Technical Education and Vocational Training). She is also an introvert. In the home she does not seem to be close to anyone. She has been sponsored by SEA for a year and a half now. She also comes from a very poor background. Both her parents are peasants in Dhading. Like Pradip, she was first sponsored as a boarder at Shree Liti School and was shifted to the SEA Home early this year. She is also repeating her 7th grade. At her first term examinations she got a percentage of 39. She shows interest in her studies, though. She is trying to improve in her studies. She is very attentive in class, but she fears to ask questions. A professional training could also be an option for her if she cannot manage to catch up. But the priority for her at this point is to build up self-confidence. She needs to be more interactive with others. She is a kind and sweet girl. He is too funny. He likes to play football and crack jokes. He shows dedication towards his studies and he gets good reviews from his teachers. He is trying to improve in his studies and doesn’t hesitate to ask questions or to take help from his seniors and friends in case of need. He has been sponsored by SEA since May 2013, first as a boarder at Shree Liti School, then, since last April, in the SEA Home in Sadobato. He now studies at MAV in 8th grade. He also had to repeat his class 8, because of his poor level of English, which is not his fault, though, since Shree Liti is a Nepali-medium school (being a public school) – whereas MAV is an English-medium school. At his first term examinations he scored 68% (11th rank in the class), which is a very good performance, given the challenging switch from a public school to a private school at this level of seniority. He is not only a good student he is also a caring child. Anand is close to all in the home and is helpful as well. He is very sincere and honest. He is a brilliant and very hardworking student. 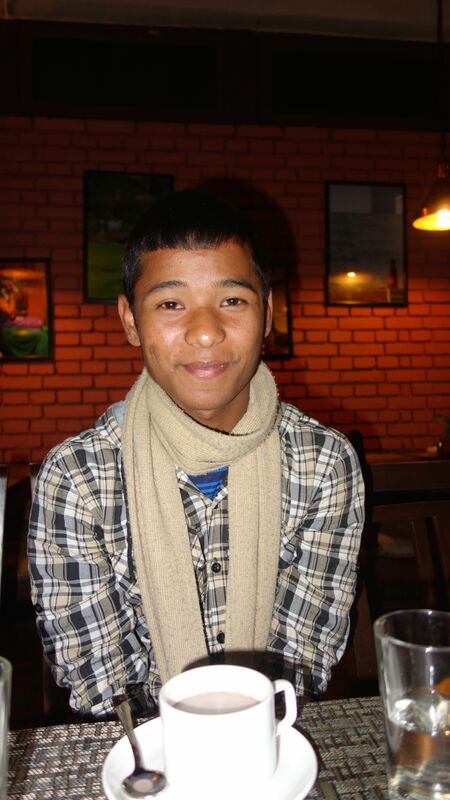 He has been sponsored by SEA since February 2013, initially as a boarder at Shree Liti School. He was shifted to the SEA Home last April. He comes from the most destitute background. His mother passed away when he was a young child; his father is a poor peasant who is struggling with severe alcoholism. He is the sole student from Dhading who didn’t have to repeat his class when he was shifted to a private school. He is now in 8th grade at MAV, and he got 78% at his first term exams! He ranked 4th in his class and secured the highest score in math: 90%! This is truly a remarkable achievement for a student that senior coming from a public school. No doubt that he will go far in his studies. He is very curious by nature. He is also helpful, honest and sincere. Like Anand, he is very funny and loves cracking jokes. He is caring and frank with everybody. He is also a good and very hardworking student. He has been sponsored by SEA for a year and a half now, first as a boarder at Shree Liti School, then, since April, in the SEA Home at Sadobato. He also comes from the most destitute background. He has no father; his mother lives on odd jobs in Dhading. As he is a very good student he had gotten scholarship from nearby schools which enabled him to get an education. This year, like most of his SEA friends from Dhading who were shifted to MAV, he also had to repeat his class, because he didn’t master English sufficiently well. So he is still in grade 8. He got 60% at his first term examinations and 85% in math, which is also an excellent achievement! When he is in confusion in his homework, he doesn’t hesitate to ask his seniors. He is a very nice boy, helpful, sincere and caring. He likes to play and watch movies. He does his housework on time and is close to anyone. Bikram has been in the SEA Home since May 2011. Like all at SEA, he comes from the poorest background. He is a good and brainy student, albeit sometimes lazy. He is very competitive by nature. He does his housework on time. When he does his homework, he is keen to ask questions when he does not understand things. He loves playing football. His dream is to play football at a national level. He is now in class 8 and he got a percentage of 70% (coming 7th) at his first term examinations. He is a very nice boy. The remarks above are based on the outcome of a meeting that Tara didi and we (the seniors) held a short while ago. We all sat down for a meeting to discuss the features of our newcomers. – Among the newcomers, Saroj, Deepak and Anand are really good and happy to be at SEA. – Pramila and Pradip are trying to catch up with the level of their peers. – Pradip is slow minded but has been trying to improve his behavior. – Most of the newcomers are introvert: they need time to be close to others in the house, which is more than natural, but some are really fun-loving and interactive. – All students are trying their best to do well in their studies. – Boys are interested in football, while girls are interested in singing and dancing. – Most of our students are helpful and caring. – No one has got any complaints from the teachers so far. – Many of them are caring, sensitive and mischievous. – Anjali is the most helpful girl in the kitchen and other homely works. – Usha is a very good singer. – Ankit is the most intelligent of all. – Bikram is very competitive. – Sneha shocked everybody by her intelligence and her poetry writing. – Simran is the most lovable and helpful and caring. – Anu is very hard-working. – Rammaya, the mouse, is the ultimate successor in her studies. – Prabin, despite being so mischievous and sleepy, always shocks everybody by his good results at school. – Aruna is the sweetest girl, with a beautiful smile, and who never gets angry. – Charimaya is the most talkative. – Sandesh is the most lovable, funny, and clever of all. With all of these diverse characters, which make each of our kids special in its own ways our new generation of students offers a truly unique face. Seniors are really happy to be with them and, similarly, juniors are delighted to be at SEA. SEA has provided us with enormous facilities and has shown us their love and care, which makes us feel even more special and too lucky to be at SEA. Marie-Helene (mom), all the sponsors, Tara didi and all the SEA kids make this world a beautiful place – a world of sharing happiness and sorrow, while living under the same roof. The famous quote from Denis Waitley: “The greatest gifts you can gift your children are the roots of the responsibility and the wings of independence”, embodies the spirit of the SEA family, where each SEA kid has responsibilities to fulfill, so that it can carry out works by itself and realize its outer purpose in life. This is very important for a person to move forward in life. Likewise, we, the seniors, are assigned duties like giving tuitions in the evening and morning. We are very lucky and happy to be at SEA. And, lastly, on behalf of all the SEA kids, we want to thank SEA from the bottom of our hearts.